The intertidal regions of the world are lush habitats with a variety of plant life. Plants that live in these zones are accustomed to extremes in water supply, as plants may be completely submerged at high tide and completely exposed at low tide. 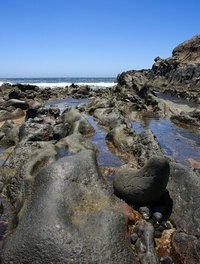 Intertidal regions can occur along river banks, marshes, the ocean and in fresh or salt water. According to the Sea World website, sea grasses like eelgrass and surfgrass are among the only flowering plants that live in the intertidal region of the sea or in the sea at all. These types of plants are often found in great amounts in intertidal regions where they provide a degree of shoreline protection against erosion. Seaweed is classified as a marine algae and is a commonly found in ocean intertidal regions. Marine algae lack root systems, do not flower and have no true leaves or stems. Some species use gas-filled bladders that allow parts of the algae to float along the water and maximize surface area for photosynthesis. Marine algae is extremely diverse, ranging from size from as small as microscopic plankton to giant kelp. The red mangrove is a tree that grows primarily in intertidal salt water regions of bays and lagoons in certain parts of the world. The tree reaches a mature height of nearly 82 feet. Fruit produced by the tree is brown in color and grows into an egg-like shape. The tree's leaves are thick, evenly bright green and come from yellow to white flowers during the beginning of the growing season. The sea grape is essentially a tree that grows in tropical intertidal regions of the world, including Southern Florida, according to the website for Andrews University's biology department. Leaves of sea grape are mostly round in shape and green in color with red veins. The plant can grow to a height of about 19 feet tall and bares fruit that hang in long clusters similar to grapes on the vine. What Does Salt Water Do to a Plant?